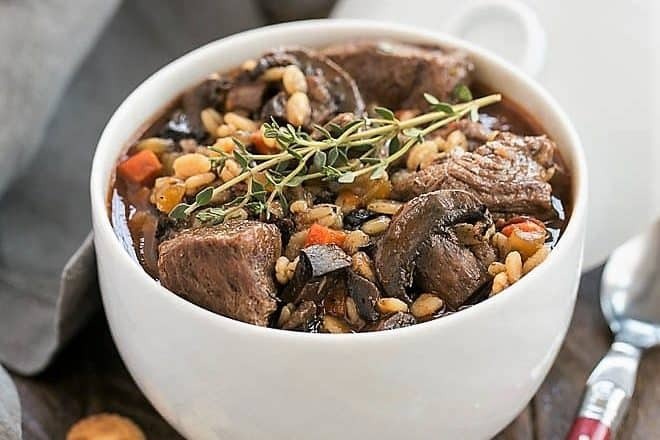 Beef Mushroom Soup with Barley is loaded with a double dose of mushrooms, tender beef and barley. Almost a stew, it’s the perfect comfort food on a chilly night. I’ve shared a tasty Beef and Barley Soup on the blog before, totally from scratch down to the beef broth. 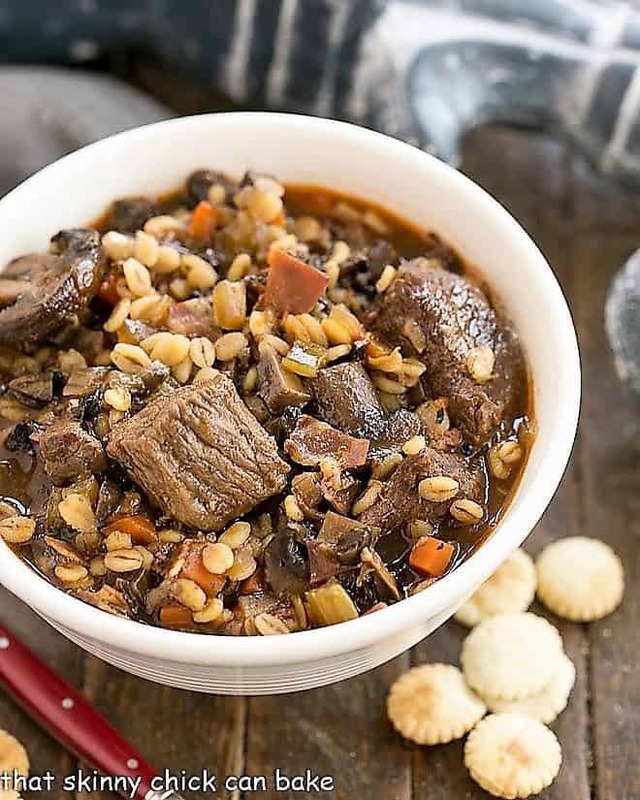 This is another beef and barley soup, but with loads of umami which makes it truly memorable. Plus you don’t have to make your own broth, which is a nice bonus! Umami is a Japanese word that translates to “savory taste, ” and joins sweet, salty, sour and bitter as one of the tastes our taste buds detect. It’s often described as meaty, full or savory taste and is attributed to glutamates, a type of amino acid and a few other substances. 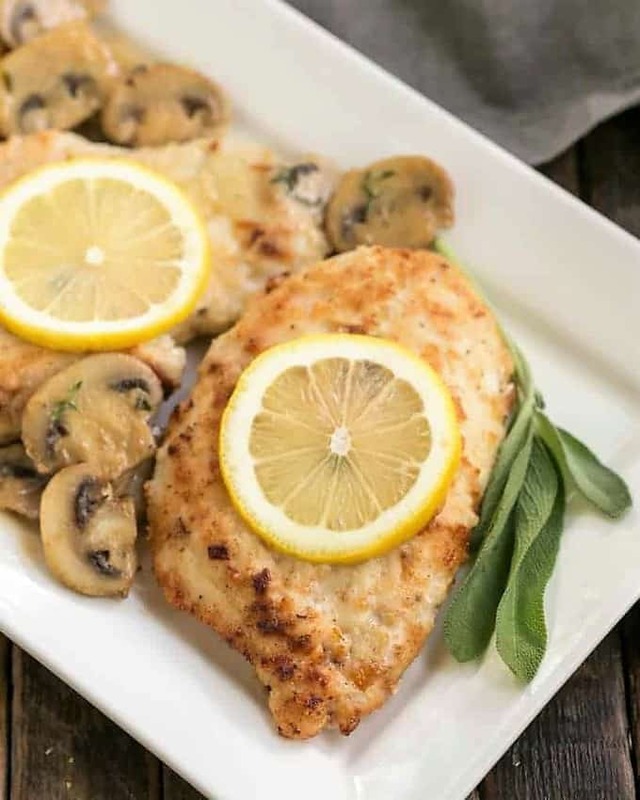 Foods known to add umami to a dish include beef, pork, chicken, shrimp, soy, tomatoes, Parmesan, mushrooms, and more. 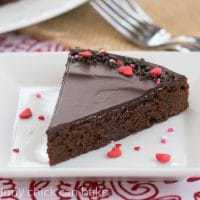 You may be familiar with the word glutamate as it’s part of MSG (monosodium glutamate), the food enhancer with the bad reputation for causing headaches and allergic reactions. But it truly does the job for which it was created. Using foods to get your umami instead of a chemical prevents those nasty side effects! This beef mushroom soup with barley contains beef, tomatoes, mushrooms, fish sauce, carrots, onion, and garlic. That’s a LOT of umami! 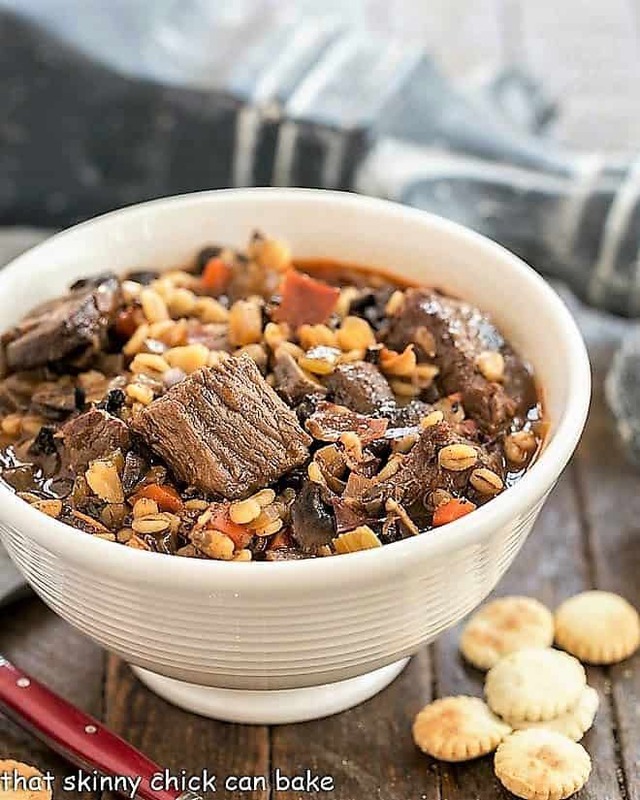 This beef barley soup is layered with flavors, making it rich, hearty and delicious. My biggest tip is to watch the sodium and taste before adding any salt. Between the pancetta, broth, Worcestershire sauce and fish sauce, there is plenty of opportunity to make an overly salty soup. I recommend Pacific brand broth as it’s not overly salty. If you use something like Swanson’s brand, which I find saltier, you might want part to be low-sodium. I like using a combination of both beef and chicken broth instead of all beef. 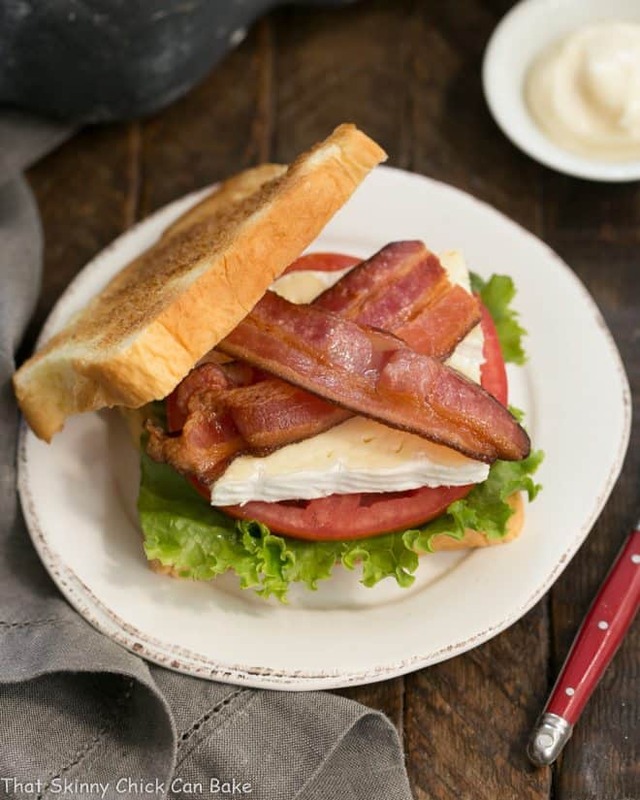 Feel free to use bacon instead of pancetta or just leave it out if that’s your preference. I used quick barley as that was all I could find in the market post Christmas, but regular barley would work well. The quick barley only takes 10 minutes to cook, so add it about 10 minutes before you want to serve. If using regular barley, just read the packaging for cooking times. 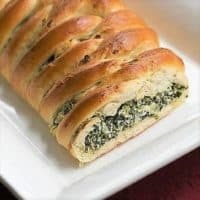 You could also add pasta, white rice, or brown rice instead. I prefer using chuck in my soups and stews as it melts into tender beef as it cooks in the broth. Searing it first adds another layer of flavor via the caramelized brown bits, or fond, left on the bottom of the pan. If you don’t have fish sauce on hand, you can definitely leave it out or use soy sauce instead. Both provide some of that coveted umami! You may also like my Vegetable Beef Soup with Roasted Garlic, this Slow Cooker Beef Stew with Mushrooms or this Easy Black Bean Chili. 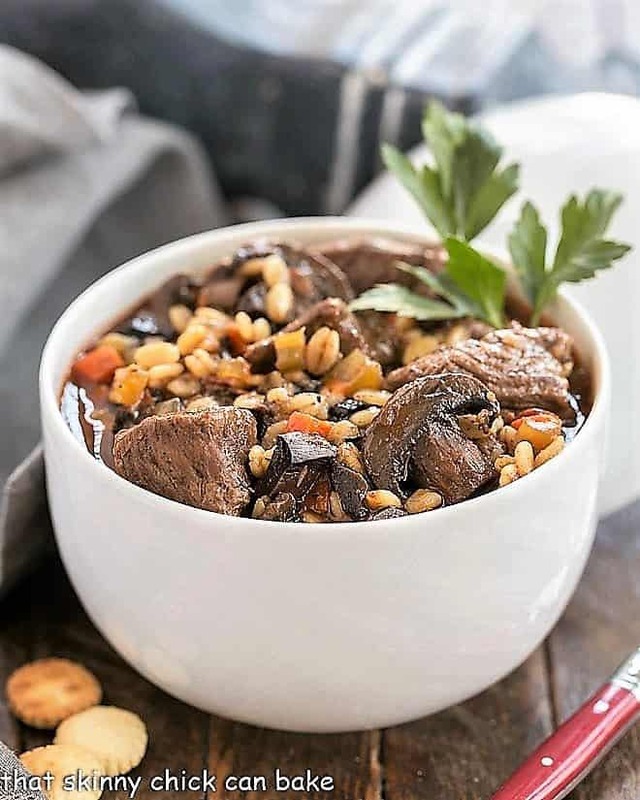 A hearty, flavorful beef mushroom soup with barley. Drain the mushroom water through a sieve into a bowl and set aside. Chop the reconstituted mushrooms and set aside. Heat 1 tablespoon olive oil in a large Dutch oven or soup pot. Add the pancetta and cook until lightly browned. Add the beef and brown on all sides (may add a bit more olive oil if needed). Add the onions, carrots, celery and fresh mushrooms and cook until tender, 5-10 minutes. Add the broths and deglaze the pan by loosening up the brown bits on the bottom of the pan. Add the pancetta, beef, reserved chopped mushrooms, reserved mushroom water, bay leaves, balsamic vinegar, Worcestershire sauce and fish sauce and bring to a boil, reduce the heat to a simmer, cover and cook until the beef is tender, about 2-3 hours. Add the quick barley about 10 minutes before you’re ready to serve. When the barley is cooked remove the bay leaves, taste and season with salt and pepper if needed. Ummmm! 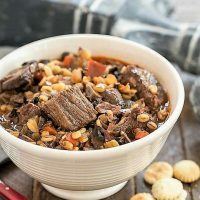 I love beef and barley soup and yours looks delicious, Liz! And mushrooms make it even better. 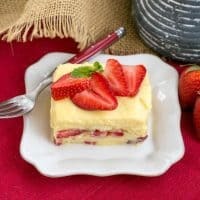 Have to make this, thanks for the recipe! Oh this is a FAB soup. I am a fan of Beef and Barley Soup, even better with s many mushrooms. It is so frigging cold here I may need a bath of it, not a bowl. Such a warming and delicious stewish soup…I love it! Barley is wonderful in soup! And pairs so nicely with beef. 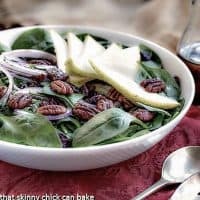 This looks terrific — we’re always looking for hearty soups for dinner at this time of the year, and this would be wonderful. Thanks! Liz, what a delicious looking soup…so hearty and packed with flavors…I love the barley in it…perfect for this cold weather. Thanks for the recipe. I hope you are having wonderful week!